It is impossible to miss out any of these skincare product shops in Myeongdong because there are just so many of them – not just in terms of variety (some of them sound very similar e.g. Skinfood, It’s Skin) but there are so much duplication of shops of the same brand within Myeongdong – you can walk a few steps and you will reach another branch of Etude House just a few metres away from another branch. A quick look at the Myeongdong map below will reveal that there are many many branches of Skinfood, It’s Skin, Etude House, Nature Republic, Tony Moly. We stayed at J Hill hotel (marked by “H” along the MyeongDong Ro. 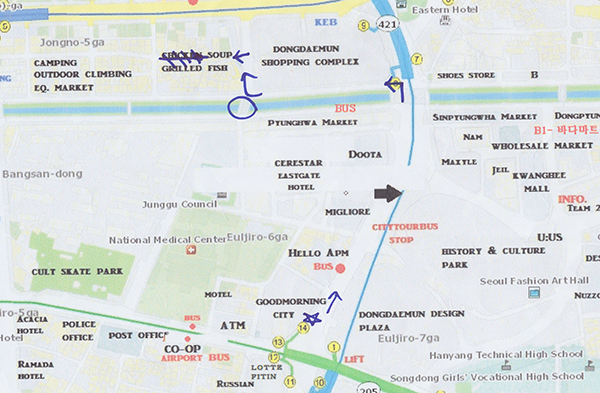 (St.) around where Myeongdong Gyoza (marked by 16) is located. If you are catching a Cookin’ NANTA performance in Myeongdong Seoul, the NANTA Theatre is marked by 12. Do not buy your skincare products anywhere else in Seoul or in fact Korea – if you have to buy cosmetic/skincare products, buy them all here in Myeongdong. Because you get free samples when you buy at any of the Tony Moly, Missha, The Face Shop here in Myeongdong and they are very generous with them – in fact for some shops, you get a free facial mask from the point you enter the door! You won’t be alone in your quest to gather up all your facial masks, powder and everything that you need to make yourself beautiful – the shops are usually very crowded and expect long queues to buy your cosmetic products especially over weekends during late afternoons/early evenings. Just another map to illustrate how many skincare/cosmetic product shops are there in Myeongdong – just look at the right sidebar. 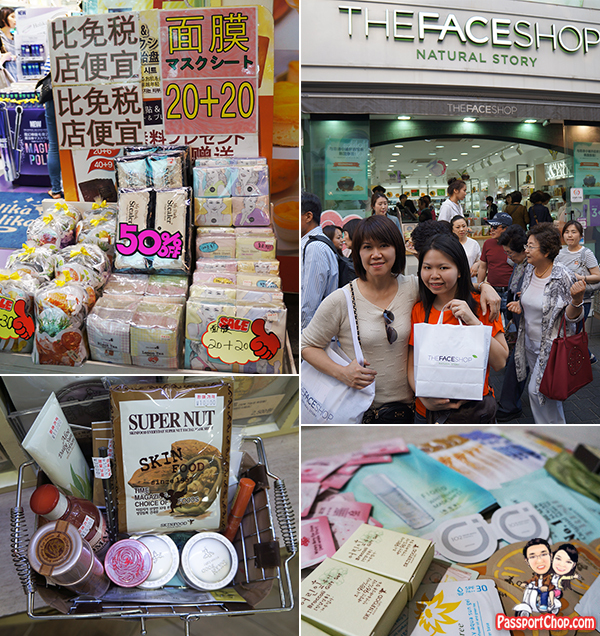 Besides buy 50 facial masks get 50 free facial masks deal and the tonnes of free samples they stuff into your shopping bag upon purchase, you can enjoy more savings while shopping in Myeongdong by printing out the Visit Korea Committee vouchers which gives you discounts off purchases above a certain amount. Ok – I believe you got my point to buy skincare products in Myeongdong but interestingly, Myeongdong is not just about skincare products – there are many other shops selling fashionable clothes, belts, watches, ties, T-shirts and shoes at the makeshift street stalls as well as in shopping malls in the area. 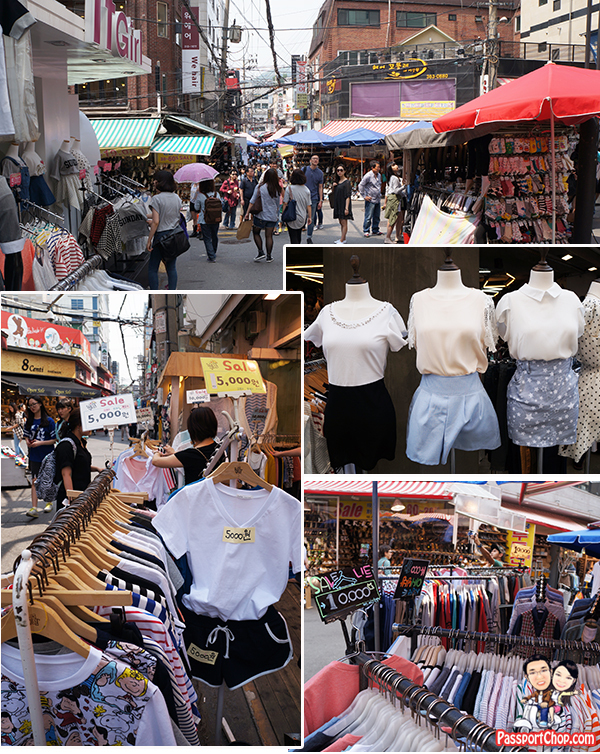 Here at Myeongdong you will also find big-name stores like Spanish fashion chain, ZARA and Forever 21. 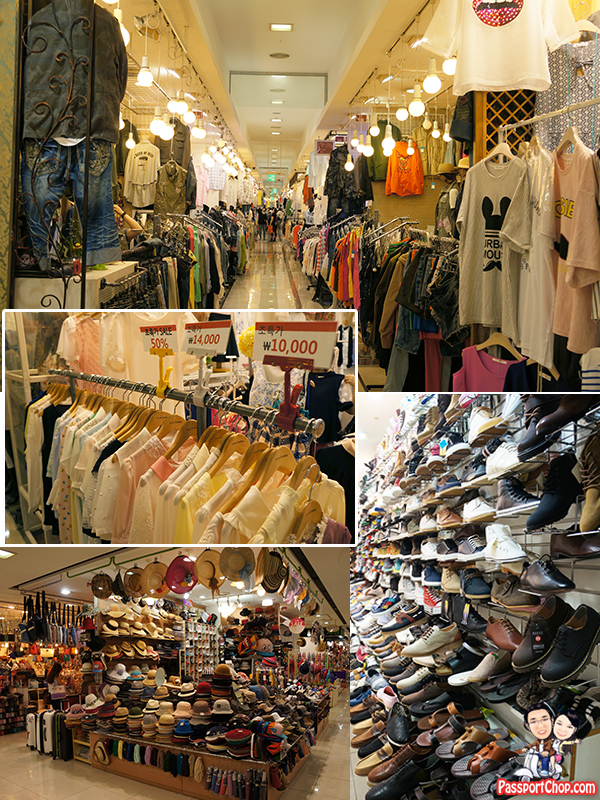 Migliore, easily accessible via Exit 4, Myeong-dong Subway Station, is a starting point to shop for many tourists coming out of the subway station. If you are buying things that cost more than 30,000 won at a shop where you are eligible for tax refund, request for a tax rebate form – you will typically be given a blue or orange colour form. Fill it up and submit for tax refund in cash at one of the tax refund outlets here in Myeongdong or at the Incheon airport if you depart back to Singapore. All skincare/cosmetic/beauty products outlet are eligible for tax refund and it is quite easy to chalk up more than 30,000 won (about 30 USD) with your purchases! There are also many street food stalls serving traditional Korea delicacies such as fish cakes, tteokbokki (a stir-fried dish made of rice cakes with vegetables in hot sauce) as well as new food inventions like the potato tornado! So if you don’t have time for a proper sit-down dinner/lunch, just grab some food on the go, shop through a few shops/street stalls and then grab something else from the next food stall and continue on! 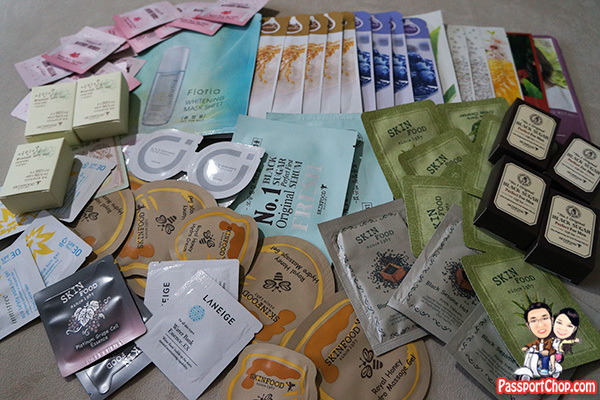 We bought a lot with just about a day of shopping in Myeongdong – this picture below shows the free samples we received (excluding our purchased items)! So don’t forget – print out your VKC discount coupons (read more abt it in our pre-trip prep post) and claim your tax refunds for all these purchases – that way, you get even more money to shop for other stuff in Seoul especially when you have 3 more awesome shopping places to check out – see below for more info! 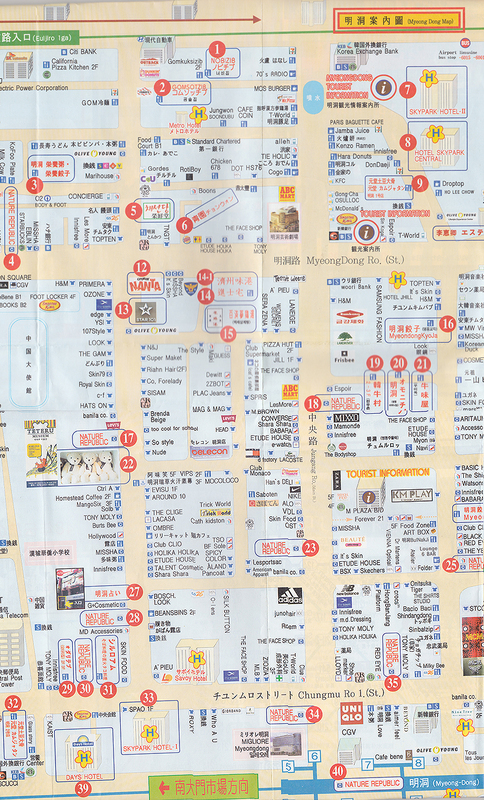 Non-Stop Shopping at Dongdaemun – Opening Hours: 10am to 5am!! This is not a typo – most Dongdaemun shops close at 5am. Shopping is taken to the extremes here in Seoul – from the thousands of beauty product shops in Myeongdong to the wee hour shopping here at Dongdaemun! Dongdaemun is Korea’s largest wholesale and retail shopping district featuring 26 shopping malls, 30,000 specialty shops, and 50,000 manufacturers. 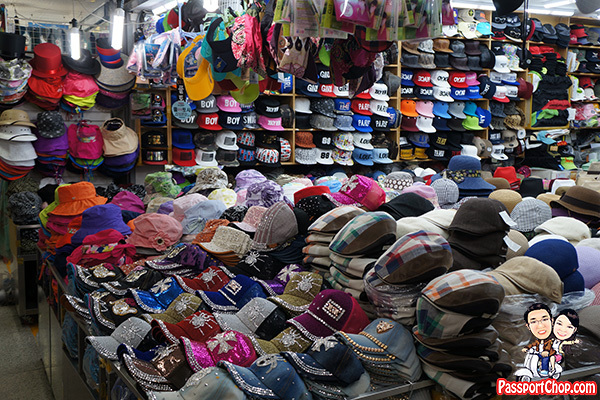 If you look hard enough (and understand a fair bit of Korean), you can find almost anything here from silks and fabric, clothes, shoes and accessories, electronics, leather goods, sporting goods, office supplies, pet products and toys. 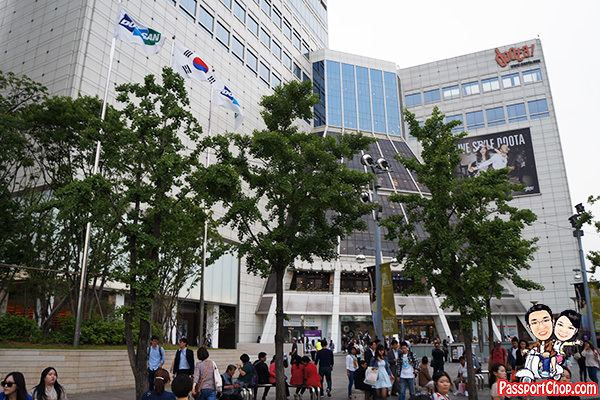 Dongdaemun shopping district is made up of 2 main sections – the retail shopping and the wholesale shopping areas. The best time to visit Dongdaemun is after 10pm when the night markets around Dongdaemun is set-up and you get complementary street food stalls to replenish your energy while you shop. The big multi-storey shopping malls Doota (located within Doosan Tower), Migliore, Good Morning City, Freya Town, LOTTE FITIN and Hello apM are lined up almost side by side at the Dongdaemun retail shopping section. 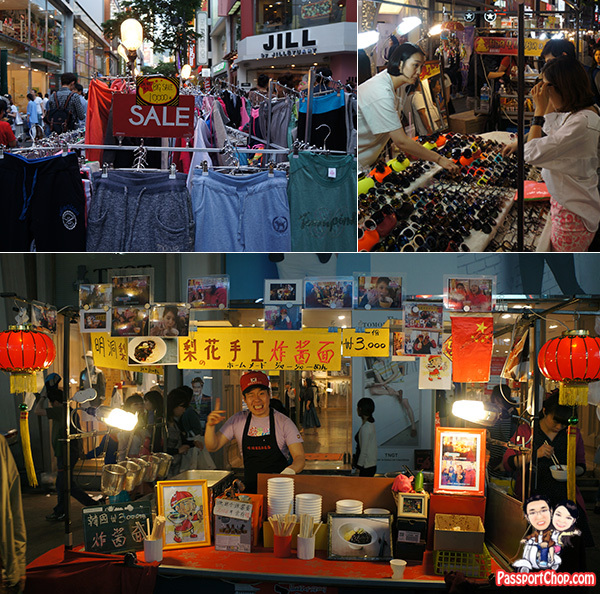 Around these big shopping malls, you will find quite a number of street stalls selling various items e.g. clothes, shoes, belts as well as food. There are also underground shopping malls all around this Dongdaemun shopping district. You can see the map below for a 3D-view of the Dongdaemun area – do note that this is an old map – the Dongdaemun stadiums had been demolished and replaced with a huge shiny object – you can’t miss it! The opening hours of the shopping malls are from 10 am to 5 am the next day. You will find foreigner-friendly facilities such as money exchange counters and information desks with multilingual staff at many of these shopping malls. Shopping at these shopping malls felt like the shopping experience in Platinum Mall of Bangkok except that it is more expensive (tops cost around S$30 – S$45) but these clothes are more fashionable and of better material than those you find in Bangkok. Most of these clothes boast of the label “Made in Korea” so these are not supposed to be cheap imports from China, thus the price. Check the labels before you buy – at least they should say made in korea before you splash out 40 bucks for them. 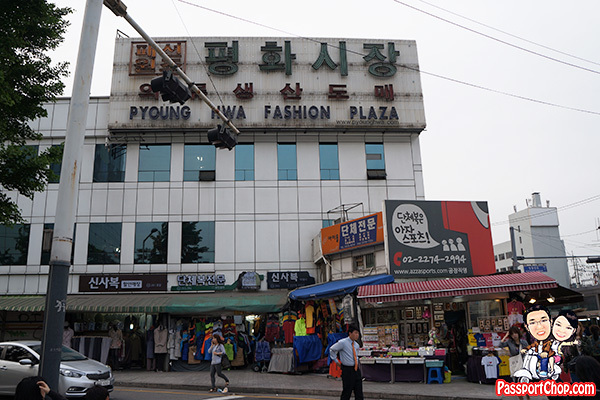 The Dongdaemun wholesale shopping section comprises smaller malls where the shopkeepers deal mainly in wholesale and retail, but mainly sell in bulk. These wholesalers are usually open at about 8 pm and close at 5 am the next day – they get quite busy late at night through early morning as the shopowners from the retail shopping district of Dongdaemun and other parts of Seoul come here to stock-up. You can also find a second-hand book street, located on the first floor of Pyeonghwa Market. The bookstores on this street have been around for over 30 years and sell all sorts of publications including novels, essays, poetry, magazines, foreign language titles and rare books, all at 30 – 40 percent off normal retail prices. While you can snack on street food stalls while you shop, there might be times when you crave for a proper sit-down dinner then I recommend you head over to Mukja Golmok, located between Dongdaemun Shopping Complex and Jongno. Literally meaning “Let’s Eat Alley”, Mukja Golmok is a street famous for its various restaurants. Grilled fish and Korean chicken soup are the must-try when you are at this alley. See map below for info on how to get there – follow the arrows drawn on the map that lead to Chicken Soup/Grilled Fish from Good Morning City shopping mall. 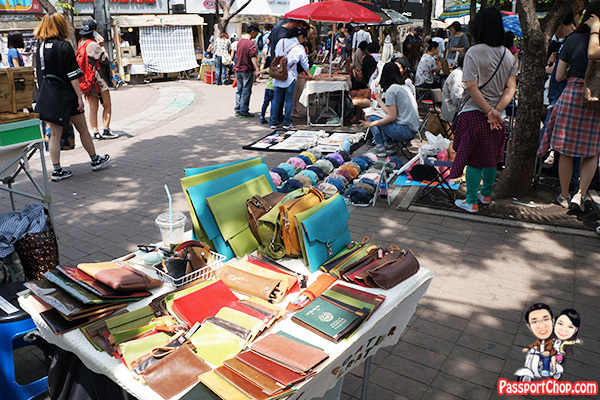 From our travel experience in different countries, we noticed that the area around universities tend to take on a life of its own as entrepreneurial students or opportunistic entrepreneurs set up shops around the universities offering affordable clothes, knick-knacks and many other things – Seoul is no different. A taxi ride from Myeongdong to Hongdae will cost you about US$8 – US$9. 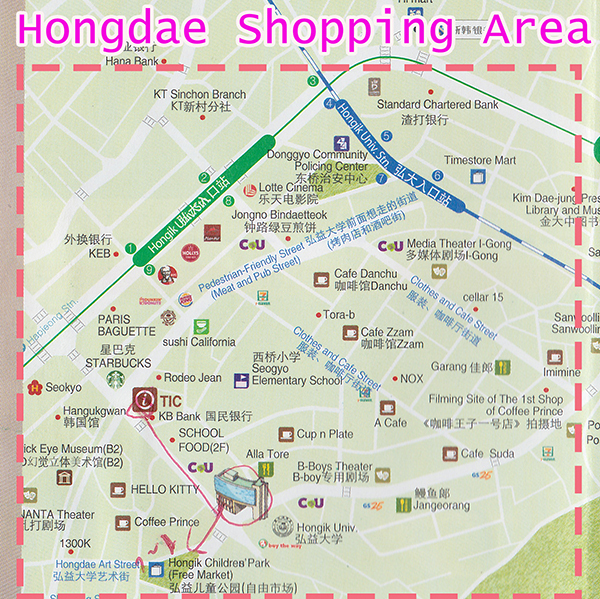 The arrows below show how to get to the Hongdae Free Market on Saturday/Hope Market on Sunday from the Tourist Info Centre. I have read your seoul blog and found the map you upload very useful. Where you get the map? Is online or take it at Seoul tourism counter? Can you advice us. Thanks for sharing Zhiqiang & Tingyi. I appreciate for your information share. Its really amazing post. It will help me whenever I travel to Korea. Our family of 4 (with 2 teenager kid)will be gg Seoul & Jeju in early December (staying at december hotel). Intend to go jeju (3d2n)direct once we reach incheon at 730am . Any places to recommend for the 1st half day & another 1.5days. We hv visited mystery Rd, Cheonyeon waterfall, dragon head rock & teddy bear museum @ 6 years ago. Please advise & thanks a lot. Hi angie – addressed your questions at the Jeju blog post where you posted the same comment. Myeongdong is NOT the only place in Seoul that provides free gifts when you purchase skincare/beauty products. In fact, I have purchased cosmetics in other places in Seoul that gave me full sized products as “free samples”. 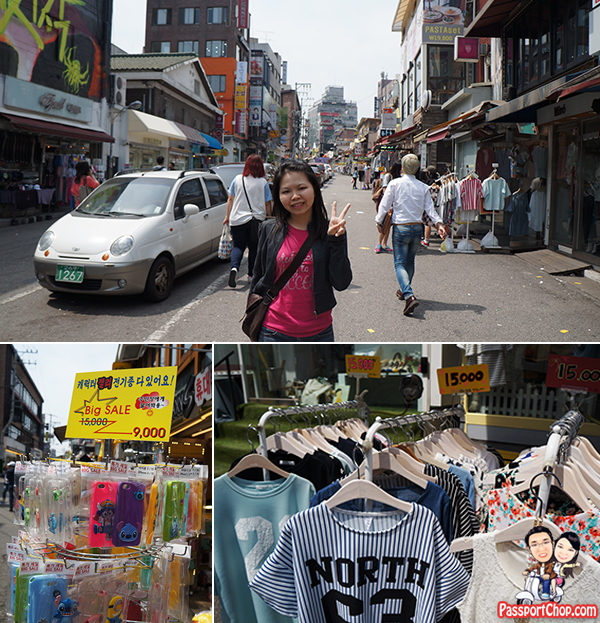 Ia will only say that Myeongdong is great for shopping for tourists because of communication. Whether you speak Mandarin or Japanese, they will always have staffs to serve you. Whereas in other parts of Seoul, it is generally more difficult to speak to them as most of them only speak Korean with minimal English. Hi, thanks for the info and pictures! They’re really helpful!! I am visiting Seoul during the winter period this year, but I wish to shop for summer clothes cos I’m from Singapore..
Are there any specific places you can recommend to me for cheap off season shopping? It would be great if you could include other touristy places as well as it is my first time travelling there!! I am planning to fly out to Seoul in the next month to buy cosmetic products to sell in my Europe. Do anyone have any siggestion where I can buy Korean cosmetic products for retailing. The ones me mentioned above seems more for tourists. Hi there in myeongdong is it possible to find halal restaurant? Hi – what time do the shops open in Myongdeong on weekdays please?? Hi may I know the best route to take from Myeondong to Ewha University using the subway? 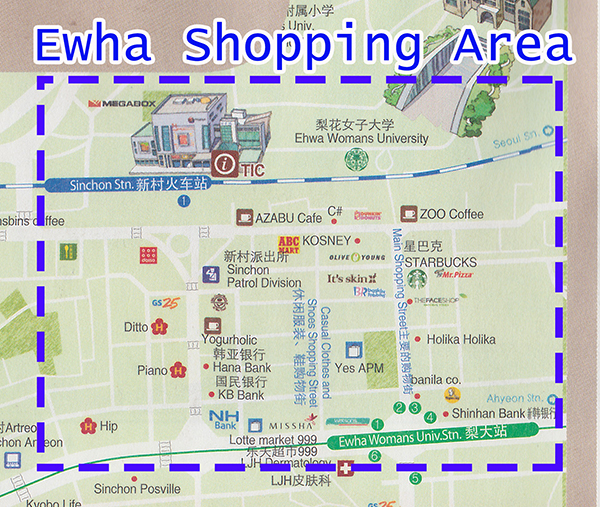 I would also like to know if there are any good places for eating at Ewha. Thanks! May I know how convenience the free wifi in Seoul..? Do we really need to rent wifi services..? As I read, free wifi still need to pay for charge. 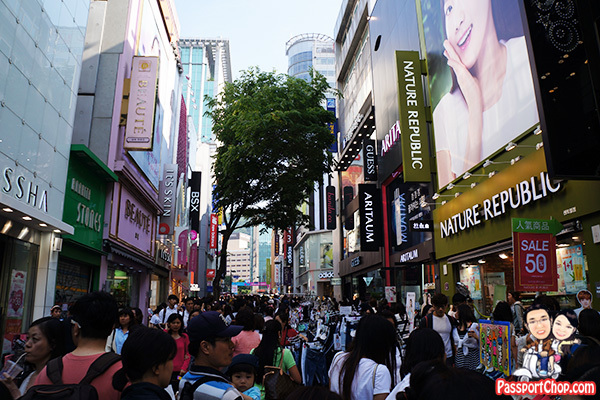 The free wifi in Seoul is available in a lot of the shopping streets – mainly in myeongdong area. whether you need to rent wifi services depend on your need, if you just need to occasionally surf the net and check emails, then the free wifi is good enough (but do note that using such free wifi services, you run the risk of exposing your content to hackers). Thank you for a very informative blog. Very detailed and thank you for the tips. I really appreciate it because it helps me a lot in making our itinerary. Its my first time to travel in South Korea with my teenage daughter. Its our birthday gift to her and we are from the Philippines. We are limiting our travel to Seoul because of a limited time and our passion is shopping! This is of great help, keep up the good work! Hello! i read your blog post and it is so helpful!! I will be traveling in two weeks time. May i know if you have any places to recommend to eat in myeongdong/hongdae/dongdaemun? Thank you so much! I am reaching seoul on sunday night. Is sunday night a good time to visit hongdae area? Hello, what time do the stalls at Ewha normally open? I’m travelling to Seoul next month. Any recommendation on the accommodation? May I know which hotel to stay? Hello, I am from Bahrain, and coming to Seoul for the first time for business, could you please let me know if the wholesale market in November sells only winter clothing? or I can find summer products as well? Hi, Would you advise if myeongdoeng shops are open until midnight? Hi do you have any idea during the Chinese new year 2018, will the shops be open? In South Korea, Seollal is one of the largest holidays of the year. Seollal celebrates the lunar New Year. Thus, shops may be closed.